How to choose dustproof methods for CNC wood router? The dust generated in the process of CNC wood router production harmed the human body especially, this problem can not be ignored, so for CNC wood router users, how to choose the right dustproof methods has become a top priority. Fundamentally eliminate dust pollution, comprehensive management to go on line, starting from the production equipment, use of advanced and reasonable cnc wood router, supplemented by some dust, dust measure. However, under current conditions, the most effective measure or choose dedusting equipment. Dust removal equipment selection to consider the nature of the operation site required degree of purification and dust and so on. For large and medium-sized wood dust wood dust can timely collection site, and for a variety of the most damaging type of fine wood dust, a traditional effective approach is to use pneumatic dust collector bag or cleaning equipment to collect. 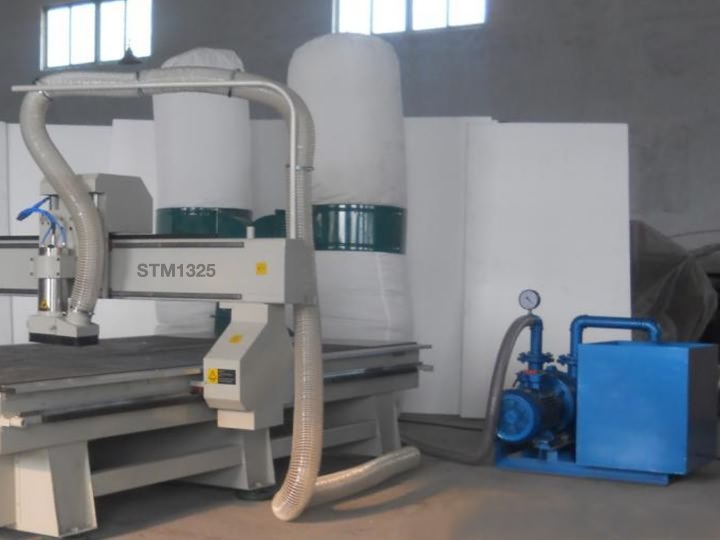 It is noteworthy that, there is no installation of large vacuum equipment manufacturers in the cnc wood router itself additional stand alone dust extraction and collection devices, can also play a good effect. For security reasons, operating workers to wear protective glasses and a dust mask to protect the eyes and respiratory organs, workers, especially in the fine type of wood dust on the cnc wood router operator should wear large masks to prevent dust damage. License: The text of "Dustproof methods for CNC wood router" by STYLECNC is licensed under a Creative Commons Attribution 4.0 International License.